That scorching hot take backfired in grand fashion, as Pederson proceeded to go 13-3 during the regular season, and then won two playoff games despite the absence of his MVP-worthy quarterback, Hall of Fame left tackle, starting middle linebacker, and starting running back, among others. On Wednesday, Lombardi struck again, this time not so much with a scalding take, but rather with a complete lack of knowledge on the Eagles' quarterback situation. "I have one crazy scenario that could play out. So Nick Foles wins the Super Bowl, he’s the Eagles’ Super Bowl winning quarterback… Are teams making calls for Carson Wentz?" So, personally speaking, if the Browns, for example, called me (I'm the GM in this scenario) and offered their next 5 first round picks, including the No. 1 and No. 4 overall picks this year, maybe I don't hang up the the phone instantaneously, but ultimately, I'm probably going to be inclined to just turn down almost anything for Wentz. In other words, it's not even a question. Anyway, Lombardi started out well enough here. 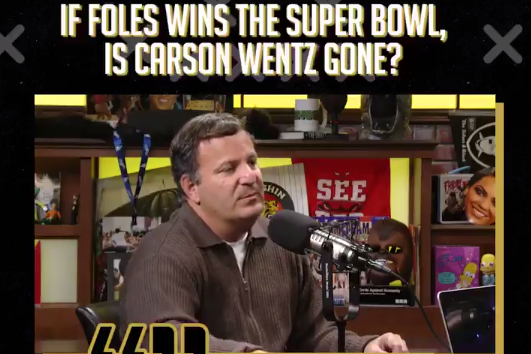 "No, because Carson Wentz was so good, right?" And then it was all downhill from there. "What Foles has done in the two playoff games has priced himself out of the Philadelphia market, for me, I think." Except, um, Foles is under contract with the Eagles next season. Why exactly would they pay him "starter money" when they don't have to? Or did Lombardi just have no idea that Foles wasn't a free agent? The reality is that the Eagles are in a fantastic situation as a result of Foles' surprisingly good play. It is in no way a dilemma. To begin, he has the Eagles in the Super Bowl. So there's that. As Lombardi rightfully noted, Wentz may not be ready to return in time to begin the 2018 season. Foles can start for however long the Eagles need him, and depending on how well that goes, the Eagles can adjust their likely desire to be extremely careful about putting Wentz on the field a nanosecond too soon. The Eagles will have no need whatsoever to shop Foles. Other teams around the league can easily identify that the Eagles have two quarterbacks, one of which (Wentz) is basically untouchable. If some other quarterback-desperate team makes an offer to the Eagles that Howie Roseman deems more valuable than the quarterback insurance that Foles will provide for the beginning of the 2018 season, then he can pull the trigger on a trade. The Eagles can do nothing, or something, and be perfectly happy either way. There's literally nothing negative whatsoever about Foles' quality play. If Lombardi is this bad playing GM from the outside, how bad must he have been with actual responsibility?